An online Bangladeshi bookseller has pulled the books of an American writer after receiving death threats from a radical Islamist. 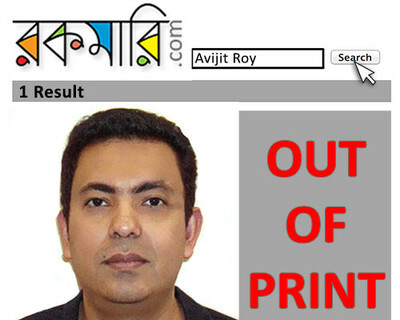 Rokomari.com stopped selling books by Avijit Roy, a naturalized American from Bangladesh who writes about science and philosophy, last month. The move followed threats by Farabi Shafiur Rahman that were posted on Facebook. The posting gave Rokomari.com's address and said the company's chairman would end up like a blogger previously targeted by Rahman. Blogger Rajib Haidar was hacked to death by Islamists after he advocated for war crimes tribunals for people alleged to be responsible for mass killings at the end of Bangladesh's 1971 war of independence against Pakistan. Rahman, a student at Chittagong University, is allegedly connected to Jamaat e Islami, the Islamist group loyal to Pakistan. Roy, like Haidar, is a secularist. Rahman has described atheists as "nothing but insects, and it is best that insects should die." In addition to threatening Rokomari, Rahman put a target on Roy, too. "Avijit Roy lives in America and so, it is not possible to kill him right now," he wrote. "He will be murdered when he comes back." Rahman argued Roy's writing defamed Islam and its prophet Mohammed. Roy denies this allegation, telling the Investigative Project on Terrorism that his books do not criticize Mohammed or any religious figure or specific religious texts. Rokomari didn't seem interested in determining if Farabi's claim even had legitimacy. Roy's books now are listed as "out of print." "This is not fair," Roy said. "These books have not been banned by the state or by a government. Because someone is threatening, how can you withdraw these books?" The other question is how a Rahman gets away with it. Bangladesh has launched war crimes tribunals against Islamists responsible for mass killings at the end of the country's 1971 war of independence. Islamists tied to Jamaat Islami, and loyal to Pakistan, rounded up and killed intellectuals in an attempt to deprive the new country of leadership. In November, New York resident Ashrafuzzaman Khan, a former secretary general of the Islamic Circle of North America (ICNA), was convicted in absentia on 11 counts related to 18 murders. Haidar, the slain blogger, wrote often about those suspected of involvement in the killings and was critical of Jamaat Islami and its student wing, of which Rahman is believed to be a member. After Haidar was killed, Rahman wrote online than any imam who leads the Islamic funeral prayer for Haidar "will also be killed. Janaza prayers are only for Muslims, not for unbelievers or apostates. Those who have spent their whole lives insulting the Prophet are not Muslims and cannot have Janaza Prayer read. Thaba Baba [Haidar's pseudonym]'s corpse should be fed to the animals in Dhaka Zoo." Rahman was arrested for making threats, but released shortly after. Nothing seems to be done to quell his ongoing series of death threats. When he threatened Rokomari with attack if it continued to sell Roy's books, which he said promote atheism, the site caved. The post included Rokomari's address. "Without contacting me or my publisher, they just went to this guy's page and started apologizing," Roy said. "After the recent controversies, we received a strong message," Rokomari said in a statement. "…A review committee has already started working to shape a policy under which no book that raises controversy will be shown on our site." In response, Roy's allies are organizing their own boycott of Rokomari. They set up a Facebook support group. And his situation is drawing attention in other circles devoted to free speech and thought. "Like me, many of Bangladesh's freethinkers have been threatened by the criminal activities of Farabi Shafiur Rahman, and it is my appeal that the Government and the legal authorities of Bangladesh should conduct a proper investigation on this criminal mind and do whatever is necessary to put him behind bars," Roy wrote in a public appeal. From the publisher's standpoint, it is logical to take the threats seriously. After Random House withdrew its commitment at the 11th hour to publish a fictional account about Mohammed's child bride Aisha, radical Islamists firebombed the home of a British publisher who picked it up. In 2004, Dutch filmmaker Theo Van Gogh was stabbed and shot on an Amsterdam street after he made a film about violence against women in Islamic societies. In 1991, a Japanese translator who worked on Salman Rushdie's book, The Satanic Verses, was stabbed to death in Tokyo. Roy said he feels safe living in America, but acknowledges threats like Rahman's will follow him for years. "Who knows," he said, "some miscreants might take him up and act on it." In Bangladesh, Rahman's threats seem to carry the weight of the law. This week, two 18-year-old students were beaten, then arrested "for religious incitement," after Rahman singled them out in a Facebook post critical of atheists. His Facebook post included a statement describing a battle in which either Muslims or atheists will survive: "It's now time to openly kill those atheists who will make obscene comments against Allah and His Messenger, giving them slow, painful death as done to Thaba Baba (blogger Ahmed Rajib Haider)." This shows how things have been getting out of hand in Bangladesh. Very doubtful how long Bangladesh stays a moderate Muslim country. The US government seems to politically support the parties who are who are supporting these mindless thugs, namely the BNP-Jamaat (Jamaat-e-Islami) alliance. Every time some terrorist/ would-be terrorist is captured in Bangladesh, it's found that they are/ was somehow, directly/ indirectly related to Jammat-e-Islami. Message to the west: STOP supporting conservative/ militancy supporting political parties. When someone/ some party is fighting for liberal ideas/ policies, don't fight against them.